The great Flood is one of the most well-known accounts in the Bible. It has been the subject of everything from Bible classes to nighttime stories to immense research and heated debate. It has stirred numerous expeditions to find the ark. Some consider the Flood a historically accurate event. Many others consider it a fable that has been perpetuated for millennia. Yet perhaps not so many realize that the story of the great Flood is not limited to the Bible. “And the waters prevailed exceedingly upon the earth; and all the high hills, that were under the whole heaven, were covered. … [T]he mountains were covered … and Noah only remained alive, and they that were with him in the ark” (verses 19-20, 23). This was a globe-covering catastrophe. If such a worldwide event occurred affecting all human life, it should be expected that ensuing generations would all have their own memories, records and legends of this epochal event. Remarkably, this is exactly what we find, all around the world. Various descriptions of a great, cataclysmic ancient flood are common throughout the nations. These common ideas point to a common root event. The account of the Flood is not just found among the Israelites, who came on the scene some 700 years after the floodwaters receded. Examining the accounts of other sources from other cultures tells us a lot about the reliability of the biblical record. Probably the most famous extra-biblical Flood account is The Epic of Gilgamesh. It is engraved on a series of tablets from the ancient city of Nineveh. The most complete tablets date to around 650 b.c., but these are known to be copies from more ancient tablets (parts of which have been found), dating to around 2000 b.c. In turn, these 4,000-year-old tablets are themselves thought to have been sourced from even older material. Chronologically, this puts the Sumerian account quite close to the time of the Flood that the Bible indicates. TheEpic of Gilgamesh describes a Noah-like figure named Utnapishtim. According to the epic, Utnapishtim built a boat within which he, his relatives, and all species of animals survived a flood that destroyed all mankind. As in the Bible, Gilgamesh states that the reason for the flood was human wickedness. Like the biblical account, the large boat came to rest on a mountain. Both accounts describe birds being released to test whether the water had sufficiently subsided. In fact, both accounts describe the use of the same bird species, the dove and the raven. Both accounts record that sacrifices were offered after the Flood, and both records say that the men (Utnapishtim, Noah), were afterward blessed. Gilgamesh differs from the biblical account in a number of ways, but the similarities as described above are too striking to overlook. Another ancient account of a great Flood is the Babylonian Ark Tablet. This dates to around 1900–1700 b.c. The god described on this tablet instructed Atra-hasis to build a boat for himself and the animals to survive an imminent flood. It also specifically states that the animals entered the boat two by two. The Bible records the identical fact: The animals boarded in pairs (Genesis 7:2, 8-9). 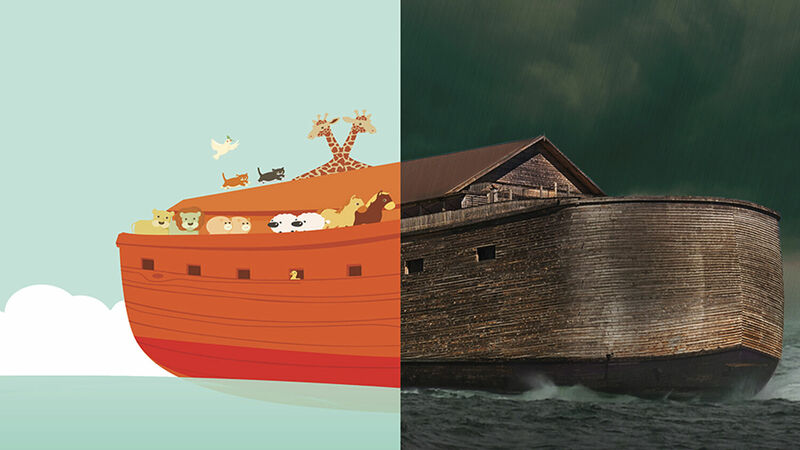 The Ark Tablet also differs from the biblical narrative (for instance, describing the boat as perfectly round in shape), yet the commonality with the Bible in other details is remarkable. The Greek myth of Deucalionstates that after human beings were created, they disobeyed the gods. It was decided that they should be destroyed. The righteous Deucalion and his wife were spared in an ark from the flood that destroyed mankind. Deucalion’s ark landed on a mountain, and after surviving the flood, he offered sacrifices. Interestingly, Deucalion’s great-grandson was Ion. Ion compares to Noah’s grandson Javan, whose name is actually spelled with the Hebrew letters I/E, O, N.
The ancient Chinese told many myths about floods, some describing the waters as “reaching heaven.” In some of these legends, the main character is a female named Nüwa (a name strikingly similar to Noah). She repopulates the Earth and repairs the broken heavens. In imagery invoking the rainbow of Genesis, Nüwa patches the damaged sky by smelting stones of five colors. Then there’s the Hindu tale of Manu, who is warned about a flood and builds a boat to contain the seeds of life with which to repopulate the Earth. His boat, tugged by a fish, comes to rest on a mountaintop, and Manu offers a sacrifice. You can read further of Irish and Welsh flood myths, Finnish and Norse flood-deluge myths, numerous African flood myths, Pacific flood myths and ancient American flood myths. This begs the question: How did all of these completely different peoples, all over the globe, get the same general—and sometimes very specific—ideas? In an article titled “Why Does Nearly Every Culture Have a Tradition of a Global Flood?”, John Morris, Ph.D., described his collection and analysis of more than 200 accounts of floods, originally reported by missionaries, anthropologists and ethnologists. The deduction is straightforward and sound. A common idea points to a common experience. And the story of a great Flood must be one of the most common in human history. Many scoff at the biblical story of a great Flood. Yet its account has been preserved by so many ancient civilizations right around the Earth. Dismissal of this event out of hand would be either naive or intellectually dishonest. What must have happened to trigger the recording of such stories? Perhaps a great worldwide flood really did happen—one that would have thus left a significant historical and cultural mark afterward, not just on the Israelites, but on all mankind. And if the Bible is right about the great Flood, what else is it right about?